Sariska Palace built as a hunting camp for the royals; this palace is open to visitors all throughout the year and provides best accommodation around Sariska Tiger Reserve. Set in opulent grounds, complete with swimming pool and all the amenities, the palace is now the sight of a four star hotel. The hotel is a 36km drive from Alwar. It is best recommended to club staying at Sariska palace with the visit to the Sariska Tiger Reserve that can be organized by the Rajasthan tourism development corporation that are operating the hotel at Sariska Palace. 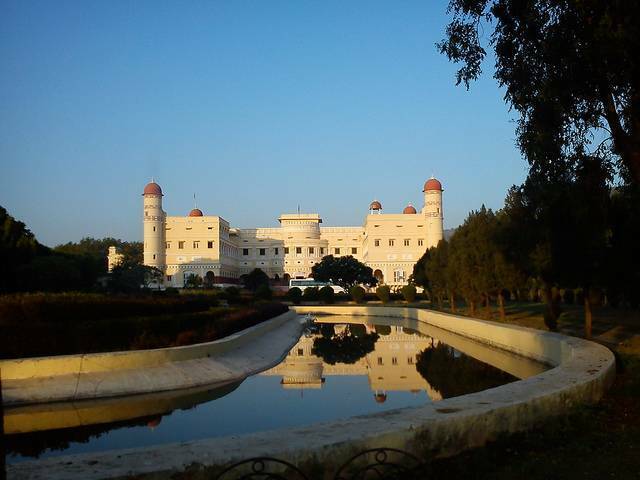 The grand building with lush green gardens and a souvenir shop to explore and shop makes the stay at Sariska Palace interesting. Do enjoy the cultural extravaganza organized in the evening tapping your feet to the tunes of Rajasthani folk songs.